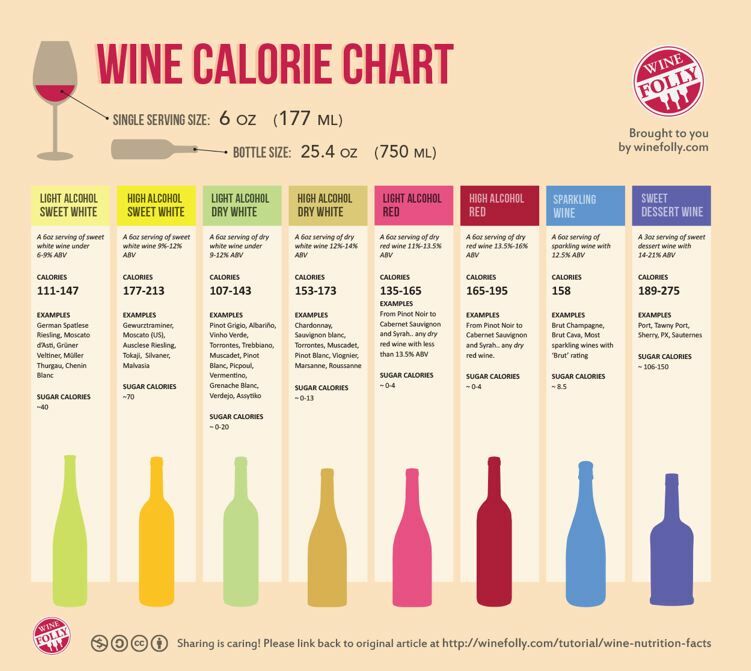 A single serving size of 6 ounces of wine has about 111-275 calories (the amount will vary depending on the type of wine and its ABV). Refer to the chart below from www.winefolly.com/tutorial/wine-nutrition-facts. A standard 12 ounce serving of beer has 150 calories as does a 12 ounce serving of Coke. Claims that drinking alcohol will make you fat continue to grab the attention of the public. Many nutritionists advocate avoidance of alcohol. They reason that since alcohol is high in calories it therefore must cause weight gain. Adding the calorie content to wine labels as is currently required on food labels has been proposed in the U.S., but so far nutritional label requirements have not been passed into law. The research into the effect of alcohol on weight is inconclusive, but many scientific studies show that liquid calories from alcohol are metabolized differently and not bioavailable. A 2002 study by researchers at Kyushu University in Japan determined that alcohol improves insulin sensitivity. In other words, drinkers process complex carbohydrates more efficiently and store less fat. A report in the drinksbusiness.com (February 11, 2015) pointed out that a phenomenon known as "drinkorexia" is becoming more prevalent. Drinkorexics swap their food calories for alcoholic drinks, a result of the increasing availability of information on the caloric content of wine, beer and spirits. The calorie information is potentially harmful to those with eating disorders. Science writer, Tony Edwards, in The Good News About Booze (2013), dispels the myth that drinking alcohol makes you fat. He cites at least sixteen epidemiological studies over the past 25 years that have consistently shown that wine drinkers, especially social or moderate drinkers, do not gain weight and even gain less weight than abstainers. Some studies even found that alcohol was “slimming” (don’t take this to suggest that drinking is a recommended weight loss method). It is true that alcohol can increase your appetite, cause you to loose self control, and lead you to eat not only more food but less healthy food, but this is an indirect effect of alcohol on weight change. Beer bellies in heavy beer drinkers are often cited as evidence of alcohol-induced weight gain, but Edwards points out that beer contains malt sugar or maltose and has a high Glycemic Index. Heavy drinkers tend to eat excessively as well. No research has been done to explain whey wine drinkers do not develop an increased waist size. The takeaway message here is that you can enjoy wine in moderation without worrying about gaining weight as long as you maintain a proper diet and perform regular exercise. A Denver-based company, BeverageGrades®, offers a website with nutritional and flavor data on more than 5,000 wines including calories, sugar, carbohydrates, antioxidants, histamines, sulfites, vitamins, gluten, pesticides and most flavor compounds. This is the first company to offer this nutritional information on alcoholic beverages. The company’s independent lab extracts the chemical DNA of wines, beers and spirits sold in the United States and a chemical fingerprint of each beverage is created including scientific taste and aroma characteristics. Consumers can access this information on the website or by use of a mobile app. Consumers are able to enter their favorite wine and find other wines with nearly identical chemical composition, as well as similar flavor, aroma and taste profiles at different price points. When I visited the site, I could not find information on most of the wines I review for the PinotFile. You will have better luck with larger, more widely distributed wine brands. Visit www.BeverageGrades.com for more information.